We've had a lot of time off this winter due to snow. Our last storm brought 10 inches of the white stuff, so we were all home together for a good number of days. It warmed up enough that we weren't housebound though, so we had fun together. We've made a lot of snowstorm sugar cookies this year! Valentine's came during the course of the storm. Lots of love in this house. The kids pretended they were arctic explorers climbing mountains. You'll be proud to know that Tess was the "first American woman" (her words, not mine) to scale several of these peaks. Drew tried a solo expedition. We've also had the Olympics to entertain us. We've been letting Tess stay up late to watch a little, since she hasn't had school. This is her tally of the different countries competing in the events. She decided to join the games by creating her own ice skating rink. She refused to try it out until the Olympics were on that night. So we were out Thurs, Fri, the weekend, then President's Day on Monday. And today was a 2-hr delay for Tess' school. In total, she's been to school 4 out of the past 21 days. Good thing she doesn't really learn much there anyway. Good thing--right? We finally had Tess' French birthday party! This was a long time coming. Tess has been planning this for months. Then she had pneumonia on the scheduled date, and we had to push back 2 weeks. A big snowstorm threatened to cancel it again, but we had a warm day and everyone was able to make it! We invited 10 friends and they all came, so we had a full house! The guest list included 8 friends from church (Lindsay Watson, Danielle James, Naomi Thomas, Audrey Bales, Avi Gardner, Patricia Pixton, Alayna Gray, & Abbie Meservy), and 2 friends from her school class (Mazee Zajac and Addison Maloney). We started by making a poodle gallery. The poodles turned out so cute! Each one was different with its own style. They enjoyed this more than I anticipated. Then we moved on to the Poodle Adoption Station. 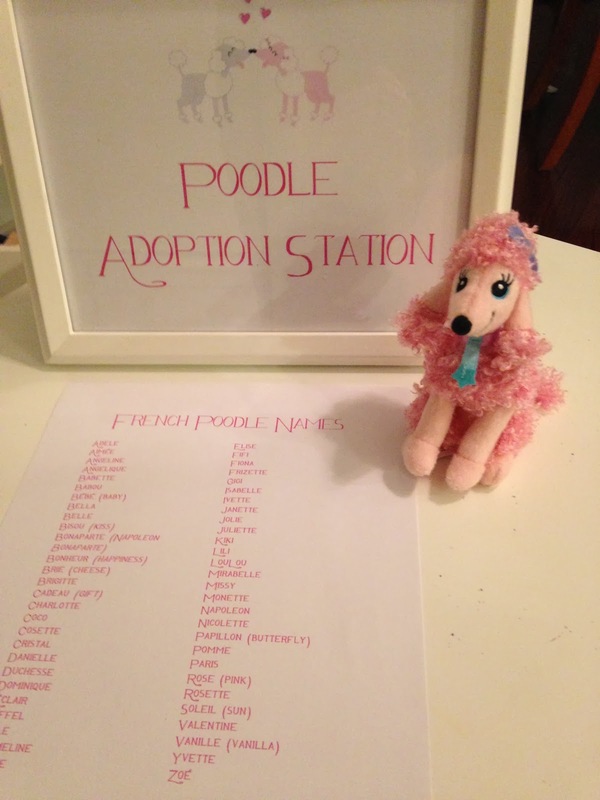 Each girl got to adopt their own poodle and pick out a French name for their dog. They filled out adoption certificates and gave Tess a coin, which she rang up with her cash register. They also personalized doggie bowls for their poodles. Follwed by a rousing game of pin-the-French-flag on the Eiffel Tower. Then poodle cake and ice cream. She got a million presents with Hello Kitty on them. Lots of new projects to work on. I had considered another French art project, but Tess had begged, "Please Mom, can't we just have some free time to play?" So I scrapped that idea. So they played with their puppies and the prizes in their gift boxes. It was lots of fun, but I'm glad we finally got it done! Next year I'm seriously considering a half-birthday party in June! Drew's first "D." He's becoming a good drawer in his own right. Tess' writing is improving by leaps and bounds as well. I love the ice skating marks on the pond and the snowman's hot chocolate.